The Japan Rail Pass is an unlimited travel pass on the entire JR Lines for the designated period of 7 days, 14 days and 21 days, and it enables those who come to Japan on a short stay status to travel in Japan rather reasonably, compared with full fares they would pay otherwise. You can make as many bookings as you like free of charge, though I wouldn't recommend you to be a no-show. They are valid consecutively. There is no flexible type of the pass unlike the Eurail Pass and so on, besides regional ones such as the JR East Pass, the Kansai Thru Pass ( valid on private or municipal railway and bus lines ). The drawbacks of the pass are that you can't take the Nozomi train on the Tokaido-Sanyo Shinkansen, and that you are imposed of limited express and sleeper surcharges of approx. 10,000 yen when you use the sleeper berth on an overnight sleeper train. 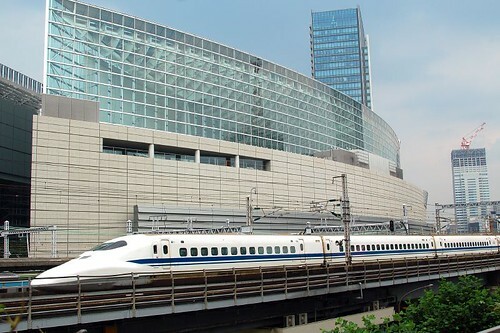 There are three kinds of trains on the Tokaido-Sanyo Shinkansen Line, Nozomi, Hikari and Kodama. The Nozomi train is most frequent and fastest of the three. The fact that you aren't allowed to take the Nozomi when you are headed to Hiroshima or Hakata from Tokyo is a vital disadvantage. While the Nozomi runs 3 times an hour between Tokyo and Hiroshima directly, the Hikari doesn't run directly on that segment. You need to change at Shin-Osaka or Himeji. 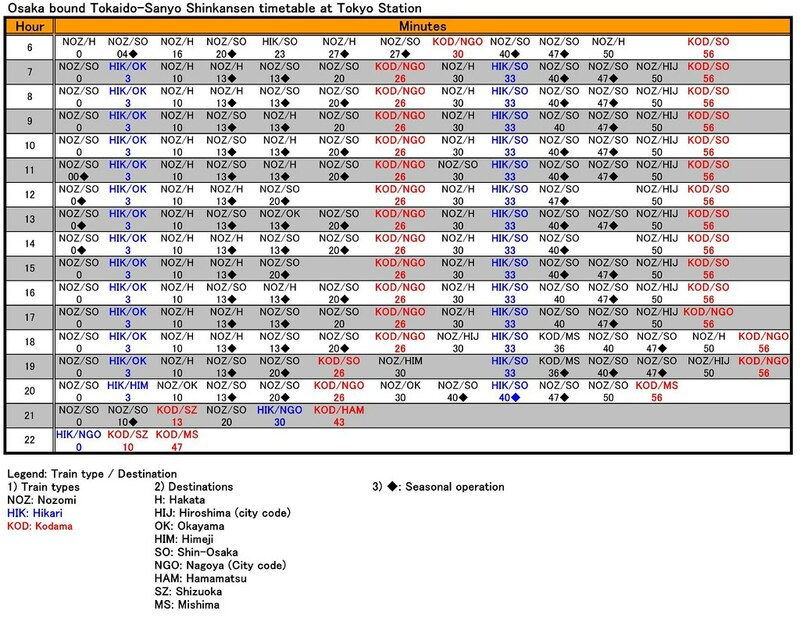 Also on the Sanyo Shinkansen segment between Shin-Osaka and Hakata, only one Hikari per hour runs in the daytime, and furthermore, it consists only of 8 carriages, while all the Nozomi trains on the Tokyo-Hakata segment, and all the Hikari trains between Tokyo and Shin-Osaka or Okayama consist of 16 carriages, though there are some exceptions. However there is a very good point on the Hikari running between Shin-Osaka and Hakata, or what is called 'Hikari Railstar'. The seat configuration in the reserved ordinary carriages is 2-2, while on the other Nozomi and Hikari trains it's 2-3. The reserved seats on the Hikari Railstar serve as semi green class. On the second link, upper left and right, and both of lower images are all of reserved seats. The upper middle one is of non-reserved seats. As to the difference between the green car and the ordinary car, refer to the link below. The image on the left is of the ordinary seats, and on the right of the green seats. They are inside the Shinkansen train series 700 in the photo below. 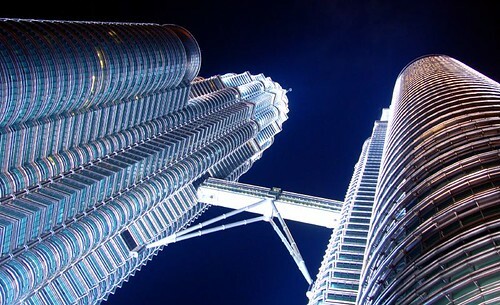 Whether to choose to travel in green class or not entirely depends on your your preference. Before purchasing the pass, you might want to calculate how much money you are likely to save through it, utilizing the train fare and schedule search sites. Link to hyperdia: Tick the column 'except Nozomi' when you take Hikari or Kodama. jorudan: Useful for other JR lines than the Tokaido-Sanyo Shinkansen. It's on a fine line whether to purchase a 7-day pass or not for those who will fly into and out of Narita, get around Tokyo for a few days and make a return trip to Kyoto because the price difference between the total cost of individual tickets and the JR Pass priceis not that great, and what is more, one can't take the Nozomi between Tokyo and Kyoto on the pass. It takes 2 hours 18 minutes from Tokyo to Kyoto on Nozomi, and it runs at least 4 times an hour, while it takes 2 hours 41 minutes on Hikari, and it runs only twice an hour. BTW, as to Kodama it takes 3 hours 41 minutes and runs every one hour. There are 5 Nozomi trains between 7 and 8 am, while only two Hikari leave for Kyoto and beyond. Seems JR Central is trying to lead customers to take the Nozomi at any costs. Narita Airport -> the Center of Tokyo: 3,500 yen on the 'Suica and NEX' combo. (Total cost can be reduced to 30,720 yen if you can purchase two single discount tickets valid for Nozomi for 12,600 yen each way from a ticket shop who resells proper multiple discount Shinkansen tickets to individual consumers. For those who prefer flexibilities on an itinerary, the price difference of 4,260 yen might be negligible. 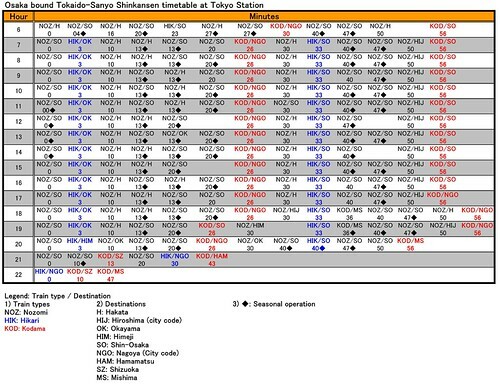 If you choose to take the non-reserved carriage from Tokyo to Kyoto, the difference will decrease to 3,450 yen. Nearly all the Nozomi originates at Tokyo, you can surely get a seat. There is no train originating at Kyoto, so you might book a seat when you return to Tokyo. Furthermore, if you don't mind taking the Keisei limited express, the difference decreases to 2,530 yen. Please don't get me wrong, as I'm limiting this theory in the case where one makes round trips between NRT and Central Tokyo, and between Tokyo and Kyoto. In case you travel farther than Kyoto from Tokyo, or if you travel to Nikko as a day trip or two on top of the return trip to Kyoto, you can optimize the pass. I'm not 100% sure whether this can be said about the reverse case, a return trip from Kyoto to Tokyo with the flights into and out of Osaka Kansai. There are various useful JR Lines such as the Yamanote Line, Chuo Line etc which connect travellers touristed spot to spot inside Tokyo. Kamakura and Nikko are also covered from Tokyo by JR.
BTW, there is a discount ticket from Osaka Kansai Airport (KIX) to Shin-Osaka, Kyoto and v.v. That's the 'JR West Kansai Pass'. 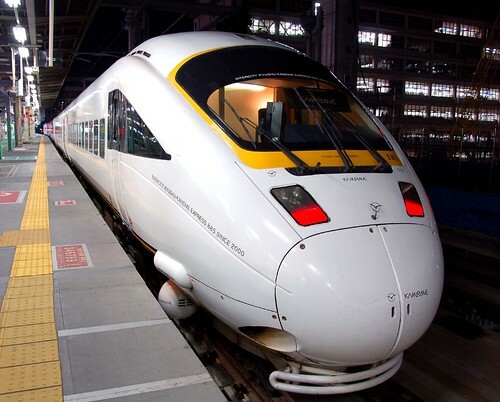 The one day pass costs 2,000 yen, and it enables you to take a non-reserved seat in the limited express Haruka between Kansai Airport and Kyoto. You can purchase as many vouchers as you like outside Japan at one of the designated agencies, which are all the same as the Japan Rail Pass voucher sales ones. You can have the pass validated at a JR West counter in Kansai Airport, Osaka, Shin-Osaka and Kyoto Stations. The Japan Rail Pass is valid basically on a calendar basis. There is no 7 pm rule as seen on the Eurail Pass that you can take overnight trains leaving after 19:00 with only the following day's validity. Yet there is a special last day rule on the JR Pass. Read article #5 in the first fine print. If you travel overnight on the last day your pass is valid, the basic fare will be covered as far as you travel, including train changes, until you first exit a station. However, surcharges are only covered for the train on which you were riding past midnight on the final day your pass was valid. This can be interpreted as follows. e.g. If you have a 7-day pass, and take the 'Nobinobi seat', a carpeted semi private compartment in the limited express 'Sunrise Seto-Izumo' from Himeji at 23:35hrs on the last day of the pass to Tokyo, you don't need to pay anything for the following day's portion on that particular train ride. The train arrives at Tokyo at 7:08 next morning. Furthermore, you can take connecting trains to, say, Sapporo on the 8th day of the pass as long as you don't clear the turnstile en route. In that case, you will be imposed of the limited express surcharges between Tokyo and Sapporo. Only the base fare is valid on that segment, even though the 7 day JR pass superficially looks void on day 8. The Shinkansen - (limited) express surcharge connection discount scheme works in this case as well. The case above in the second paragraph ( Tokyo to Sapporo trip on date 8 ) is idiosyncratic, therefore those who try to carry out a similar itinerary should carry the fine print of the JR pass in Japanese with you so that the ticket counter clerk and the conductors might not mistreat you by producing it to them. I contacted JR East, and the rep thoroughly scrutinized this matter ( it took half an hour ). Totally agreed. The last day issue means you can do some pretty serious travelling across Japan with your rail pass if you time things right. In my case I went up from osaka to tokyo on the Sunrise seto sleeper saving on time and a hotel for the night, then got my plane in the morning. Simple! If you're going to use the Japan Rail Pass you should check out this great video on how to use the japan rail pass. It explains some of the more nitty gritty details like how to exchange the pass and go though turnstiles and things. I found it really helpful before I went.